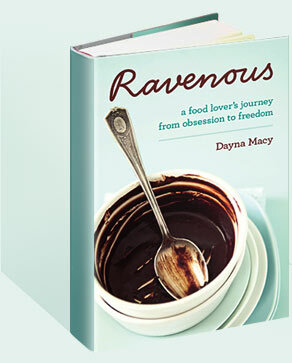 2007 September — Dayna Macy, author of "Ravenous"
I’m beginning to write a piece for Yoga Journal on fear of inversions. This is a topic I know something about — I’ve been practicing yoga for about 14 years and I still need help kicking into handstand. Not that any more opinions are needed about Britney’s VMA performance the other week… I’m just wondering what passes for fat these days? If she’s fat, where does that leave the 99.9% of the rest of us? I am currently loving Sufjan Stevens’ song “For the Widows in Paradise; For the Fatherless in Ypsilanti”. It’s incredibly beautiful — a plaintive banjo, horns, understated harmonies. But it’s all this in combination with his lyrics that really get me, and like any good lyricist, the words are big enough, and vague enough, to mean what you want them to mean.